Gibbon Slacklines Funline, shown at right, has been awarded the 2013 Kids Product of the Year Award in the outdoor adventure play category by Creative Child Magazine, a national publication that provides parents with the leading and latest information on how to nurture their childs creativity. The annual award winners are determined by a panel of parents, educators and professionals who review products in a number of different toy, crafts and games categories. Slacklining is a sport that is perfect for children and families, said Emilio Torres, vice president of sales at Gibbon Slacklines. We are working to introduce even more families to slacklining as a healthy activity they can learn to love together and are thrilled to receive this recognition from Creative Child Magazine. For those unfamiliar with the sport, slacklining is the act of balancing along a narrow, flexible piece of webbing which is low to the ground and usually anchored between two trees. The Gibbon Funline is the ideal slackline for beginners of all ages as its less dynamic than other models, making it easier to balance on. 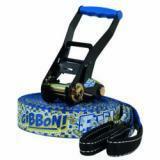 The tightly woven webbing increases the stability of the slackline and rubberized print provides added grip. The Funline is easy to set up and take down, making it the perfect activity for the backyard, park and beach. Slacklining is a fantastic form of exercise that works core and stabilizer muscles, while honing balance and concentration skills, noted Torres. For children of all ages, slacklining exercises both body and mind, which promotes self-confidence, awareness and team-building skills. Based in Louisville, CO, Gibbon Slacklines USA is the exclusive North American distributor for Gibbon Slacklines, which are sold at more than 3,000 locations on the continent.